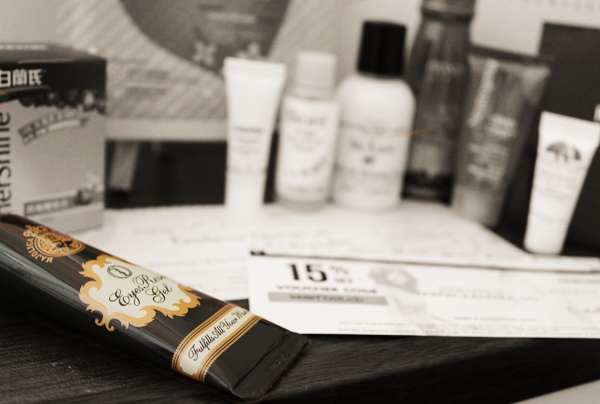 Vanity Trove is a premium beauty subscription, made available on our sunny island late last year. The trove is all about beautiful surprises at your doorstep. A summation of luxurious beauty products, experience and excitement of being something beautiful, the trove makes a lovely gift for the ladies! Each trove is accompanied with a theme and this August, we take Rocket Science classes from Vanity Trove! Brand's Innershine Prune Essence has a core made up of dietary fiber, Vitamin C and beneficial prebiotics like Oligofructose and Inulin ('Prebiotics are non-digestible foods that make their way through our digestive system and help good bacteria grow and flourish. Prebiotics help feed and keep beneficial bacteria healthy.'). This essence is formulated to help you meet your dietary fiber needs naturally! No colourings and preservatives have been added. The essence tastes very much like prune juice. Haha, obviously. BUT there are some things out there that do not taste like what they say they are. Anyway, the essence isn't as concentrated as prune juice so the taste does not linger for more than 5 seconds. This is good for those who don't like prunes! Drinking it chilled will help too! The sugar content is not printed on the box but the essence isn't sweet and I like that. There are some prune bits in the drink too, so do give the bottle a good shake first! Sampar hails from the city of love and lights... And au naturale beauty, Paris! The brand is about 'urban beauty above par' and works on the concept that the skin is sensitive to environment and so, its intelligent beauty often goes into hibernation. Sampar created the Urban Advance to provide a 'cellular shock' in order to wake up the skin's vital functions. The trove holds samples of the Equalizing Foam Peel, Poreless Magic Peel and Glamour Shot. Bioré's Aqua Jelly Makeup Remover is a little treat from dear Watsons! This makeup remover comes with a jelly texture that minimizes the amount of tugging on the skin during makeup removal. It contains 1/3 moisturizing essence, so clean away to skin that is hydrated, dewy with no sticky or oily residue! The Scottish Fine Soaps Company's Au Lait Bath & Shower Gel keeps skin well-hydrated, silky smooth and baby soft with its formula of Organic Milk ('Au Lait' means 'with milk'! 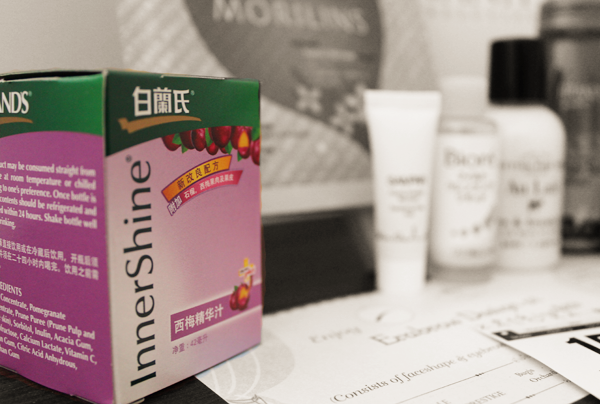 ), Shea Butter, Cocoa Butter and vitamin E.
Brand's Innershine Berry Essence with Grape Seed Extract is rich in Oligomeric Proanthocyanidins Complexes. These complexes help to improve the skin's collagen, reduce the loss of elastin (Elastin is a protein that keeps the skin firm.) and so, keep the skin supple. With antioxidants and berry extract, this essence could be your answer to youthful and radiant skin. (: This essence tastes a lot more like grapes than berries and is rather sweet. I like that it's jam-packed with berries because they are rich in antioxidants. But I'll be cautious of drinking it everyday just because it is 'too sweet' in my dictionary. Origins's Plantscription Anti-aging Eye Cream is nature's solution of taking out the wrinkles that life puts on our faces. It works on crow's feet, under eye cross hatching, crepey lids and sagginess to reveal youthful and refreshed skin! This is my first Origins product so I'm quite anxious to see how it works out for me! A full-sized tube of Majolica Majorca's Eyes Reset Gel is also included in the trove! This gel is a makeup remover that turns into oil, blends and binds with even the most stubborn eye makeup and cleans everything away with just a swipe of the tissue paper. No fragrances have been added and it is allergy-tested. Morilins's Purifying + Balancing Organic Facial Therapy Mask for Oily Skin helps to restore lost moisture and rejuvenate skin cells with Phyto-Collagen (Natto Gum. ), regulate sebum production and unclog pores with Epilobium Fleischeri (A rare Alpine flora. ), repair skin tissues and soothe the skin with Chamomile. Oxypad is an oxygen sanitary napkin that comes with an Oxy-Warning Core. It 'gives early indication of the condition of reproductive health, according to colour and odour of chip'. This is really useful and I'm just wondering why this isn't all over Watsons yet! This month's trove also comes with vouchers for Erabelle (Erabrow Design at $18 instead of the usual $29, with a complimentary eyebrow pencil. 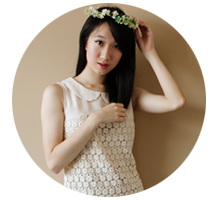 ), Zalora (15% discount.) and Origins (Free 20 minute Age-Erase Mini Facial, with a complimentary 1-day supply of Plantscription anti-aging duo.). I have started using the products so reviews will be up soon! Thanks again, Camy, for the trove and the many samples!